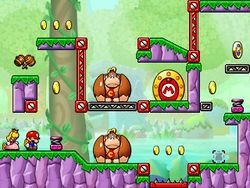 Jumpy Jungle is the second world of Mario vs. Donkey Kong: Tipping Stars. 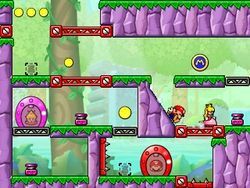 It is largely similar to its namesake from Mario vs. Donkey Kong: Mini-Land Mayhem, both for being located in an area with dense vegetation and for capitalizing the use of Springboards. The backdrop in this world features a pond surrounded by trees, with a large inactive Thwomp and several outcrops in the middle. 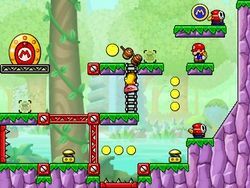 The soundtrack that plays in most of its levels is derived from Donkey Kong Country's "DK Island Swing". 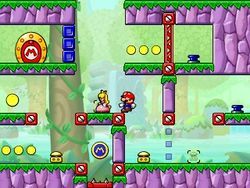 As stated above, Springboards form the main mechanic of Jumpy Jungle, and are divided into yellow springs, which launch the characters horizontally, and purple springs, which launch them vertically. 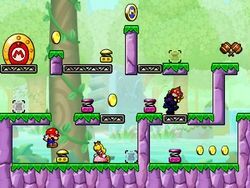 They can be collected and moved in special slots throughout a level. 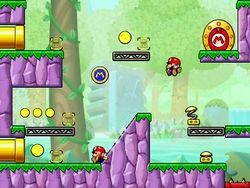 Color Switches form another mechanic introduced in Jumpy Jungle; they can be pressed to enable or disable blocks of corresponding colors, which is vital for advancing. 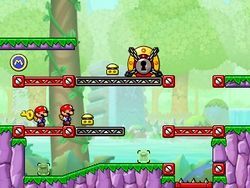 One level in Jumpy Jungle also presents rotating cannons, which are used to blast characters over long distances. In addition, the world features Shy Guys and Circus Kongs. 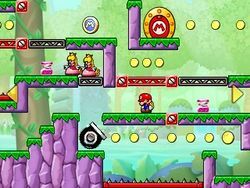 There are two Bonus Levels that are set in this world, B-3 and B-4. This page was last edited on December 5, 2018, at 23:27.